“Navigating By Hand” is an exhibition of the collected works of Chicana artist Lorraine García-Nakata. Spanning four decades of artistic practice and creation, her pieces reveal the complexities of identity, the intimacy of memory, and the art of bearing witness to one’s life. 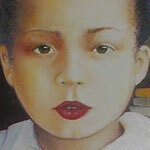 Born in 1950 in Yuba City, California, García-Nakata was surrounded by a large immediate family of siblings. 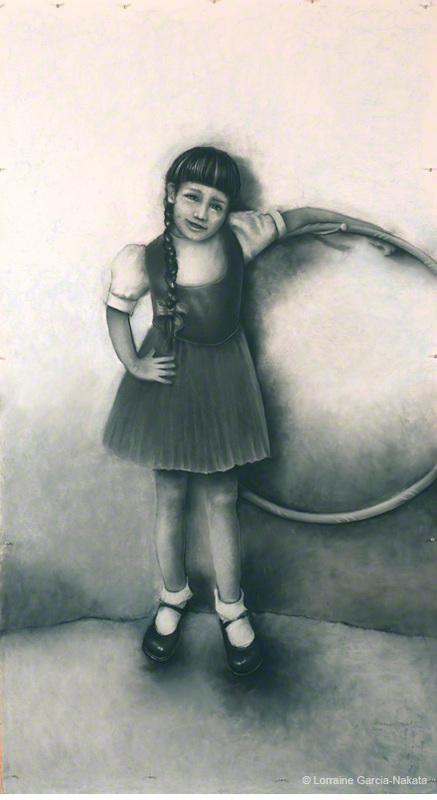 Her 2008 series of childhood portraits are seven-feet-tall, charcoal drawings on paper and one charcoal and pastel drawing on paper. These are epic works and their scale conveys the imprint that childhood has made on Lorraine’s adult perspective of the world. 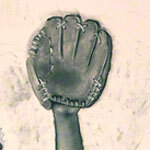 “1950’s Self-Portrait” shows a very young Lorraine in glasses and tomboy-apparel, running to catch a baseball with her mitt. The image not only captures the athleticism of childhood, but also highlights the possibilities of girlhood—before the world swoops in to enforce the gender norms of the late-twentieth-century. In the 1970’s, García-Nakata joined the Chicano/a arts collective, the Royal Chicano Air Force (RCAF), and her tomboy childhood helped her navigate gendered divisions of creative labor within this pioneering organization. The activity and playfulness of childhood is also present in “1960’s Self Portrait”; but viewers encounter a more feminine Lorraine, which aestheticizes the piece’s temporality, or visually provides viewers with the experience of watching time pass in Lorraine’s life. 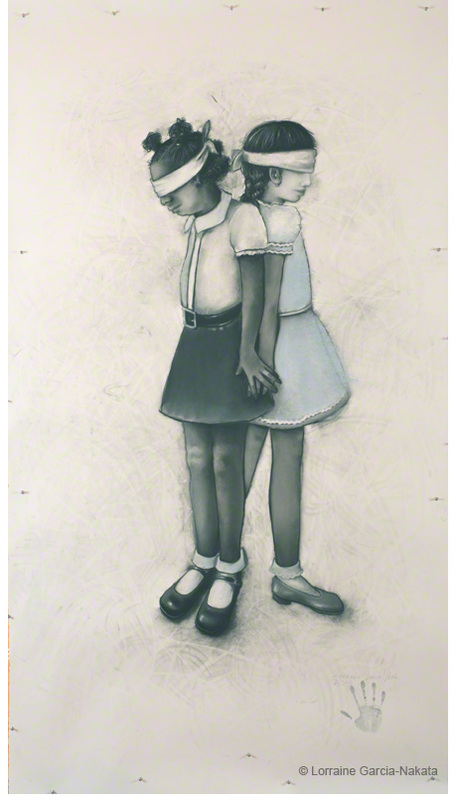 Most captivatingly in this series is the charcoal and pastel drawing on paper, “Friends, No Matter What,” which shows Lorraine and her African American friend playing a game of hide and seek. The girls’ stand back-to-back and are blindfolded. With their hands touching, the intimacy of their bodies reveals the deep trust and love between them, which resonates in the work’s title, but also powerfully invokes the historical context of the autobiographical scene. After all, it’s the early 1960s, and the realities of racism, as well as the sociopolitical changes that take place in this era, are the backdrop of Lorraine’s memory. Thus, the stakes are much higher for this pair of friends than a game of hide and seek. Lorraine’s message in this piece is clear: childhood is serious, and who we are during these formative years impacts the adults we become. 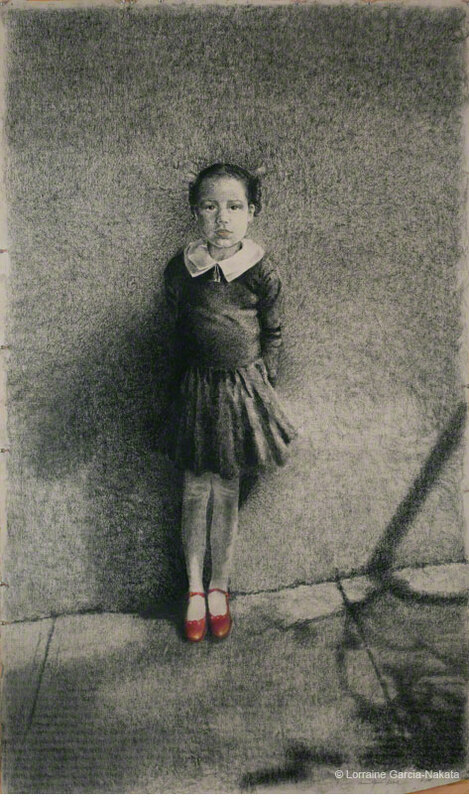 Taken together, the 2008 series of childhood portraits are a “testimonial narrative” (Beverly 1989) that García-Nakata has fashioned into a pictorial record of her life. In her adaptation, she merges the conventions of the literary genre of testimonio and autobiography. 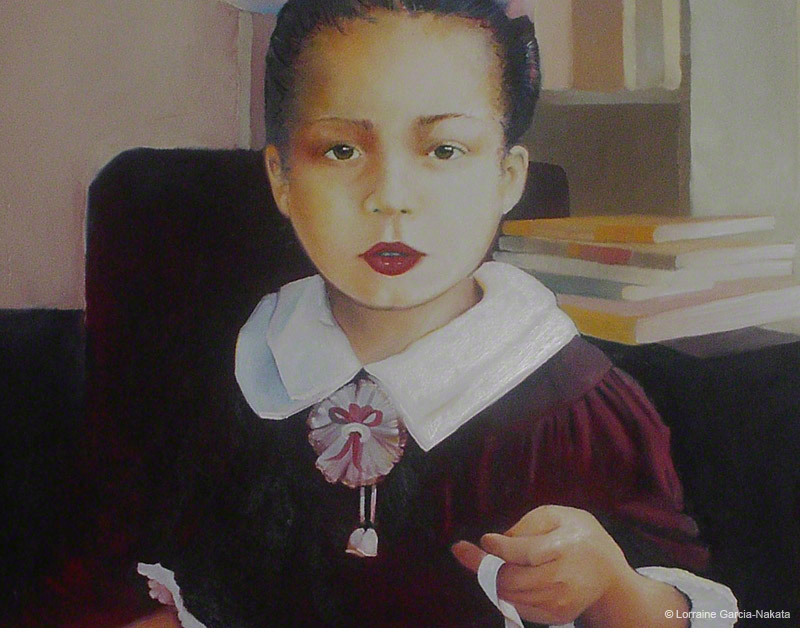 Put more plainly, while the 2008 series of childhood portraits may seem beautiful and simple, they are also incredibly powerful because they testify to one life that is emblematic of each of our lives as we are born, as we play, and as we grow up. García-Nakata adds, “For a woman, particularly a woman of color, it’s a political act to commit a lifetime to the creative process” (2013). I add that it is also a political act to monumentalize memories of everyday life. 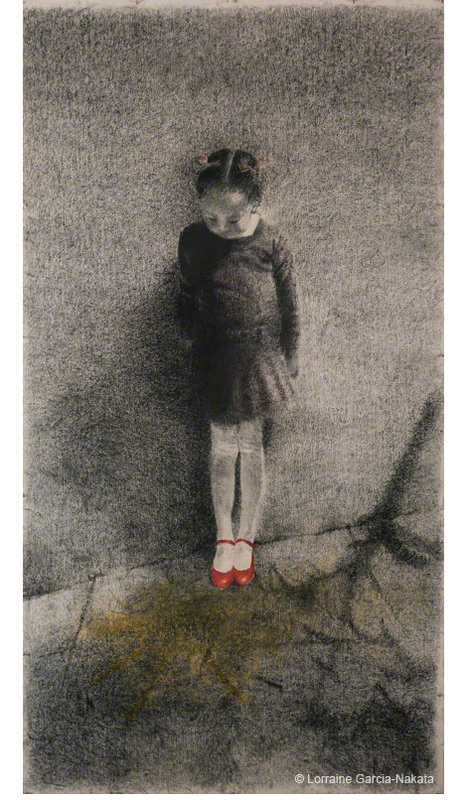 This notion is further evident in the quiet reflection that García-Nakata offers viewers in her recollection of beauty, youth, anticipation, and hope. 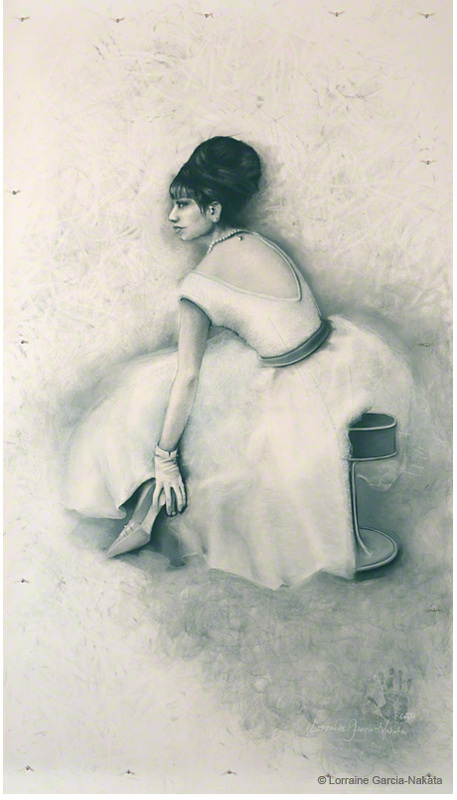 In “What, No Quinceñera?” (2008), Lorraine shares a private moment from her adolescence. 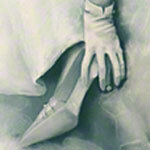 The charcoal drawing on paper is a self-portrait of Lorraine at sixteen dressing for a high school formal. As the edges of Lorraine’s dress radiate off the paper, they disappear into the background, allowing viewers to linger in the dreamlike atmosphere. Like hearing a favorite old song, or encountering a familiar smell, the piece brings readers into the autobiographical arc of the artist’s life while reminding them of their own memories and feelings from these important years. “What, No Quinceñera?” also raises the “complex intersections of ethnicity, nationality, race, class, gender, sexuality, age, and other markers of diverse identities and communities” (Latina Feminist Group 2001, 4). High school dances are an important rite of passage for American teenagers; but the American adolescence is not a universal experience. 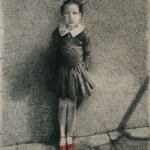 The piece’s title alludes to Lorraine’s awareness of another cultural tradition as she prepares for the dominant culture’s version of celebrating the transition from childhood to adulthood. Both pristine and dreamy, “What, No Quinceñera?” is part of Lorraine’s visual testimonio, or her pictorial “genealogy of empowerment”—to borrow an important phrase from the Latina Feminist Group in their groundbreaking anthology, Telling to Live (2001). Like other testimoniadoras who offer their lived experiences to listeners and readers “for intellectual and social justice,” Lorraine’s artwork visualizes the “homemade theories” that “help us make sense of everything that we are and all that we find and love” (Latina Feminist Group 2001, 26). 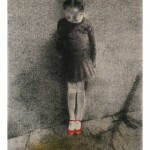 In her series of works on childhood and adolescence, it is not only an aesthetic choice that Lorraine signs each piece with her handprint—prominent on some works and more ethereal on others. 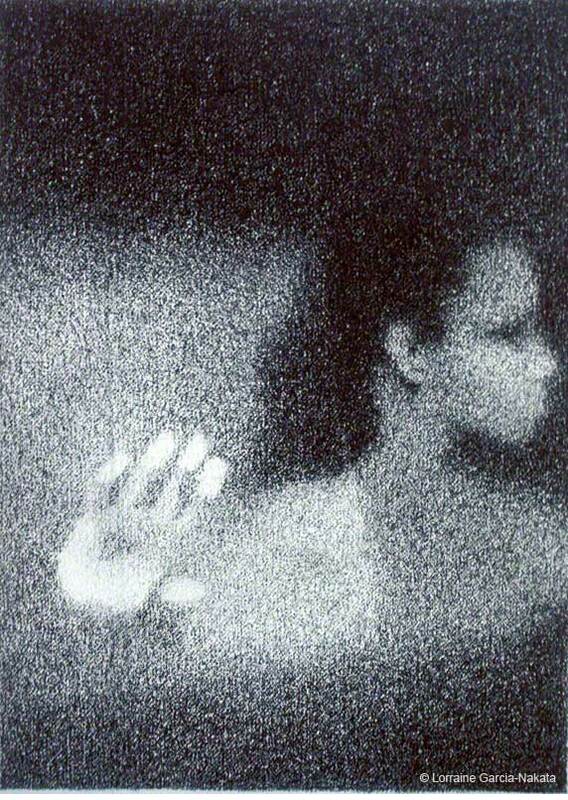 García-Nakata asserts that the handprint as her signature symbolizes her “personal commitment to the work” (2013). I add that it also conveys to viewers that these are the experiences that Lorraine swears by, that she promises are true, and that she offers with an open heart. 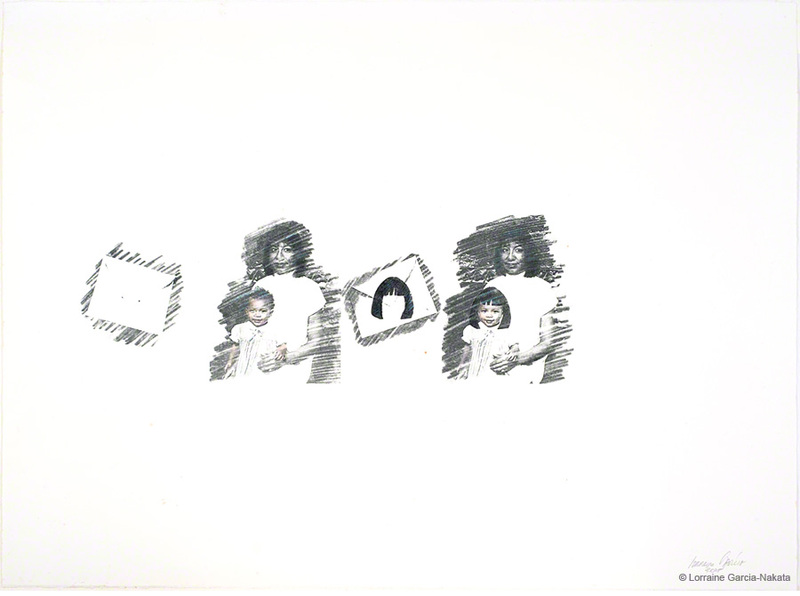 This unique signature seems to be a recent tradition for the artist; but the desire to make contact with others through her visual art is a continuous quest for García-Nakata, as is evident in “Blind Not Blind” (1980) and “Our Connection I” (1981) of her “Window Series” that she initiated in 1979. These drawings on paper “explored the idea of the window as a representation of ourselves and the idea that all matter is comprised of molecules in motion” (García-Nakata 2013). 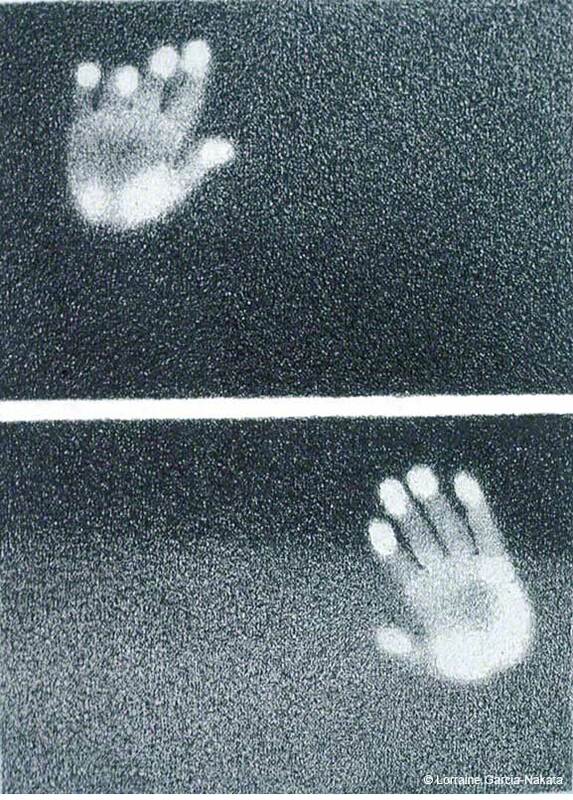 Addressing the concept of coming into being, or formation, viewers see hands reaching out from paper and attempting to make a connection. The works both locate and isolate the tactile experience of touch. 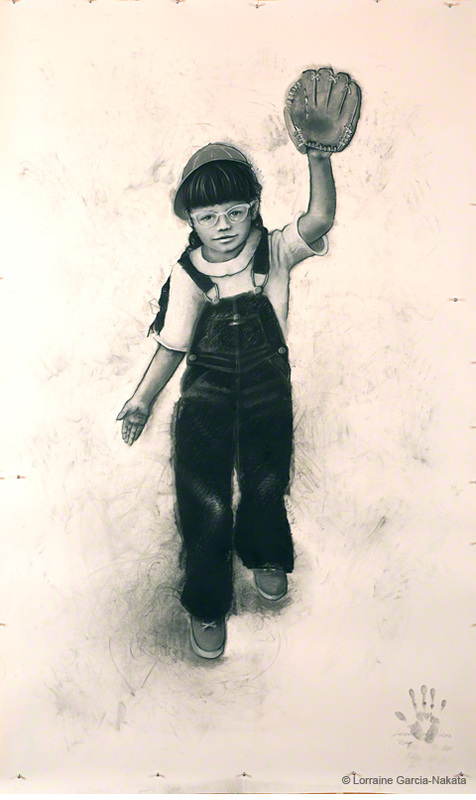 The desire for a physical connection in works from the “Window Series” also shows up in Lorraine’s 1980s sequence of mono-prints that explore the development of her individual identity in relation to her family, community, and society. As Rigoberta Menchú (1984) states in her trailblazing testimonio that “My personal experience is the reality of a whole people,” (1984, 1), Lorraine’s mono-prints impart the reality of her identity, which is comprised of family and ancestry, as well as ethnicity and culture. Viewers learn that Lorraine’s story is really a story of descent and her responsibility to that heritage. In “Family Line” (1989), three Lorraine’s stand at three different places in the image, composing a line. 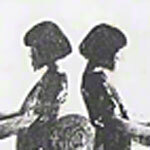 The three figures are connected to each other through antique black lace, which is “much like the lace my abuela wore on her head” (García-Nakata 2013). A culturally significant fabric for Lorraine, the lace symbolizes the colonial aspects of her identity that are passed down through the generations, along with the indigenous ancestry and cultural-ways that comprise her. 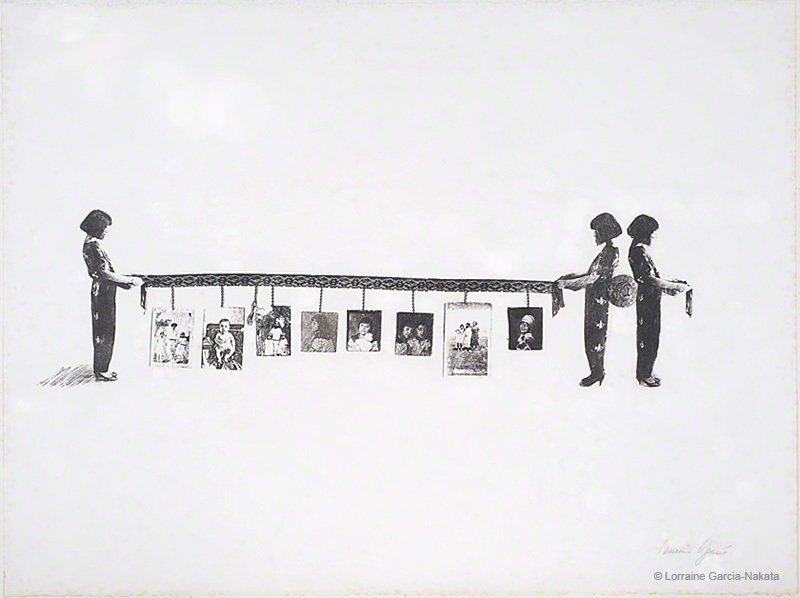 In “Family Line,” the first Lorraine holds the lace from which family portraits are hung. The second Lorraine holds the other end. 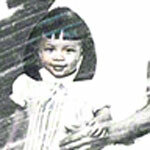 But the third Lorraine faces away holding a bundle of lace in her hands. Her posture suggests that she awaits the next generation to come and take up the other end. Lingering on this theme of future generations, Lorraine’s artwork also suggests visions of ancestry that are bound to colonial encounters that have made and continue to make all of our lives possible in the Latino/a diaspora. 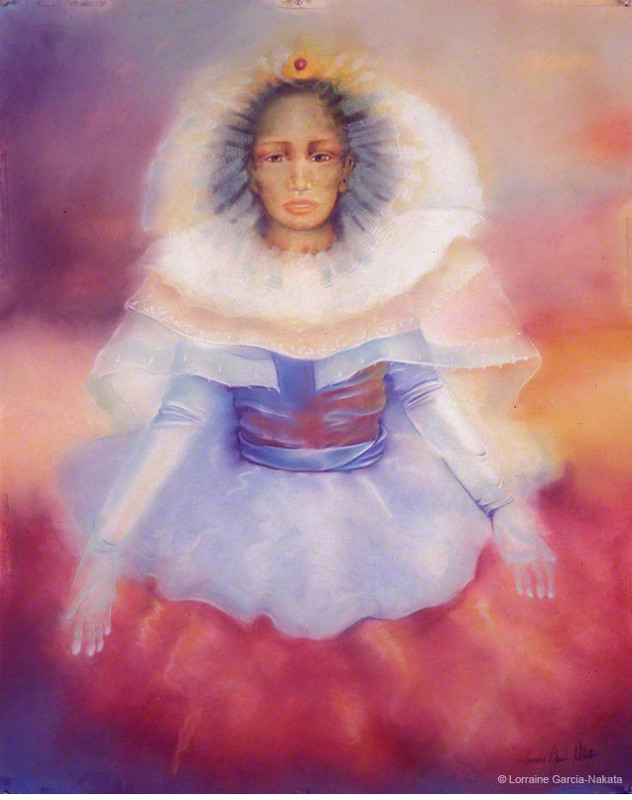 In her tradition of large scale work, Lorraine created the diptych, “Facio Nova Omnia II: Colonia” and “Facio Nova Omnia II: Indigena” in 2004. 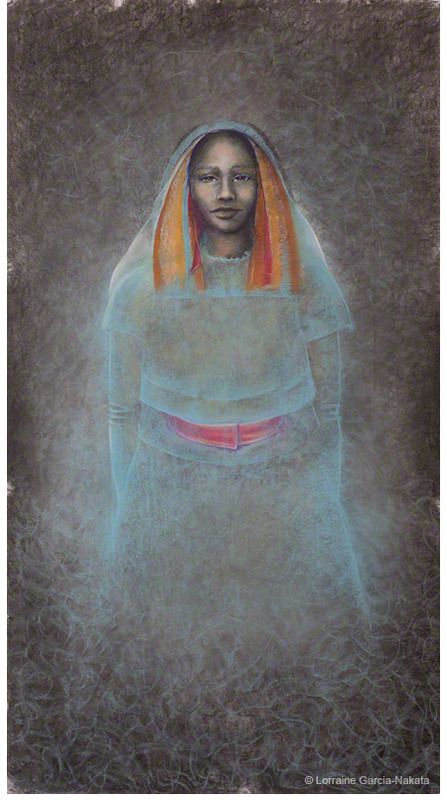 The titles are Latin for “I make new all things,” and these pastel drawings deal with the ethno-gendered politics of colonization, locating the origins of Lorraine’s Chicana ethnicity in Indigenous and Spanish women’s bodies. The figures are spectacularly beautiful and I believe this is an important point to make because they invite viewers to perceive beauty in the formation of Chicana-Latina identity, a process that historically was a violent and ugly part of conquest. Strikingly, the figures give their backs to viewers but, while the Colonia is completely turned away from our view, the Indigena gazes over her shoulder, hinting at a point of eye contact and connection. García-Nakata writes, “As Chicanos/Latinos, we embraced the indigenous aspects of our being in the 60s/70’s, then circled back around to later acknowledge colonial aspects of our history/identity. In this case however, our indigenous knowledge, ‘precious knowledge,’ leads the way, sets the standard for how we proceed into our future-as we acknowledge all aspects of ourselves” (2013). In this grand diptych, García-Nakata is concerned with the spaces and times of Chicana-Latina identity, as she frames the emergence of her ancestry between pre-Colombian and colonial female bodies. Locating the individual story within the “reality of a whole people” (Menchú 1984, 1) Lorraine denies the viewer’s gaze into the eyes of a certain woman that she repeatedly creates. 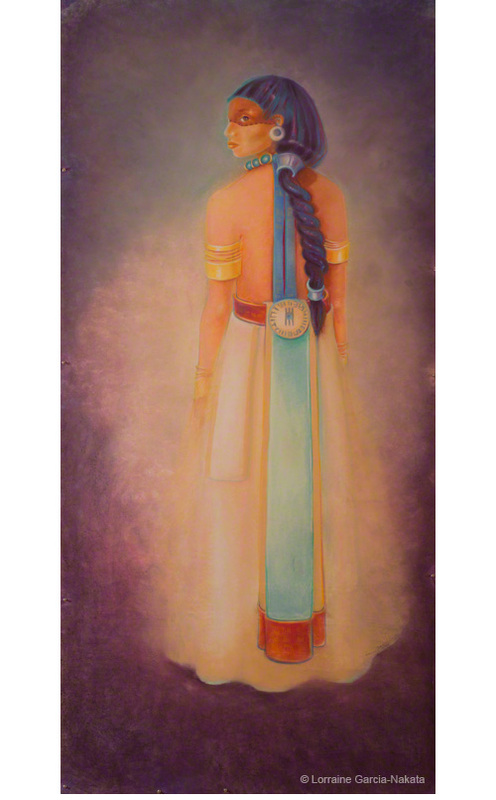 Having addressed childhood, adolescent rites of passage, familial lines of descent, and the socio-historical diaspora, Lorraine’s artwork also engages the spiritual realm and her faith and hope in it—despite the unexplained and unknown factors of the afterlife. “Since my youth,” she explains, “a woman persona … has been in a recurring dream. She provided grounding and comfort. 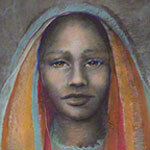 Powerful and ancient, she studies the metaphysical, natural world, and interdependence of all things” (2013). Lorraine reproduces this woman from her dreams in pieces like “The Alchemist” (2005). 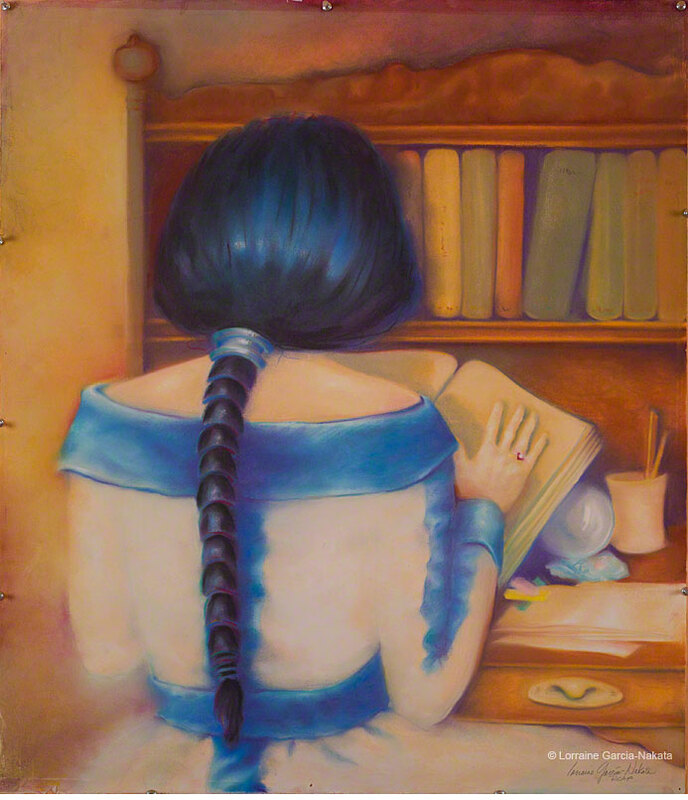 A pastel drawing on paper, there is something incredibly literary about this portrait of a young woman reading a book, sitting at a desk, surrounded by a shelf of books, writing paper, and pencils. 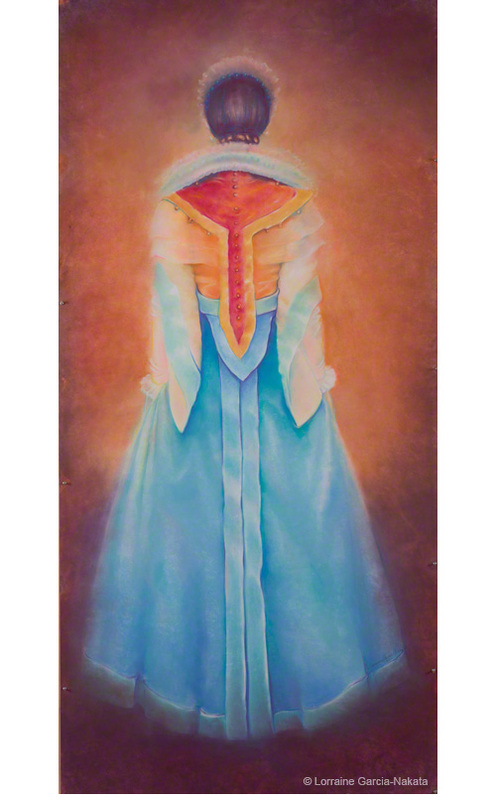 Reminiscent of the Colonia from “Facio Nova Omnia II,” the figure also evokes Sor Juana Inés de la Cruz, the self-taught scholar and poet of colonial Mexico that Alicia Gaspar de Alba reinterprets through her novel Sor Juana’s Second Dream (1999). In García-Nakata’s “The Alchemist,” viewers discover another chapter to this woman’s story, as she sits, with a long braid and perfectly fitted dress, deeply immersed in study. She also gives us her back, as if to say that her meditation, her far-off place of thought, is more important than our gaze, than our expectation of who she is and our desire to see her. An introspective body of work on the components of identity that comprise one’s world and make it worth living, “Navigating By Hand” offers viewers the story of Lorraine García-Nakata. And if viewers look closely and deeply, they will also find pieces of their own life stories reflected back. Beverly, John. 1989. 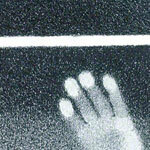 “The Margin at the Center: On Testimonio (Testimonial Narrative).” Modern Fiction Studies. 35:1 (1989): 11-28. Burgos-Debray. Verso, NY and London, 2009. (2nd Ed).The Latina Feminist Group. 2001. Telling to Live: Latina Feminist Testimonios. Duke University Press. Beautiful. The strong undercurrent of emotion is palpating. Brava!